We were not going to do a photobooth and decided last minute to look at pricing. So reasonably priced, great service, Gina was great and so helpful. Printed extra copies of needed and had the digital copies when I woke up the next day. Couldn't say enough great things. So easy to work with. I'm so glad we went with a photo booth for our event! We had talked with some people who had them for various events, since we hadn't done it before. After getting recommendations and calling around, we went with Chucklebooths because the owner was fast to respond, answered all our questions (even the ones we didn't know we should ask), and the cost was very affordable. It ended up being a huge hit! It was SO easy (we didn't have to do anything other than show him where to set up). All the guests loved it, and we saw tons of pictures on Facebook and their website right away. 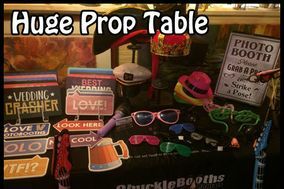 People had a blast, between all the props and how easy everything was to use. We are planning a family reunion this summer an will definitely book ChuckleBooths again. Thanks so much for being a part of our big day! Exactly what we wanted and for a great deal. The operator was very nice and professional. The prop selection was diverse. The booth was nice and roomy. Everybody enjoyed it and had a great time. They make it easy to get the photo strips online, and the send you a USB with all of the photos in addition to your album that you get the night of! They also made the photos into GIFs which is great fun. We decided last minute to look in to a photo booth for our wedding and we are so happy we did! ChuckleBooths was very responsive and everything went flawlessly. Our attendant, Jackie, was great and even went out of her way to make sure my husband and I got our picture taken. Would absolutely recommend!